Our international conspiracy thriller series The Orphan Trilogy is currently on special thru Amazon’s Kindle Countdown Deals. Twenty-three orphans with numbers for names from 1 to 23. Number Nine wants to escape from ‘the orphanage’. Meet Number Nine – an orphan, a spy, a lover…a master of disguise, an assassin, a shapeshifter…a freedom fighter, a human chameleon, a reformed contract killer. He’s all of the above. He’s none of the above. But can the ninth-born orphan ever get off the grid? To find out you’ll need to go on a tumultuous journey around the world to such far-flung locations as the Arctic, Asia, Europe, the Amazon, Africa and South Pacific islands. The frenetic cat-and-mouse chase moves from airports to train stations and hidden torture prisons, taking the reader on a page turning, frightening non-stop action ride into the world of corrupted power that goes beyond conspiracy theories to painful reality. 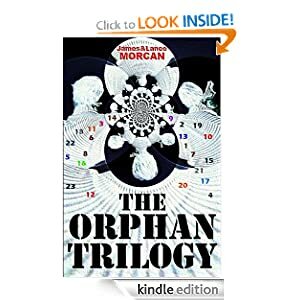 Fast-paced, totally fresh and original, filled with deep and complex characters, The Orphan Trilogy is a controversial, high-octane thriller series with an edge. Merging fact with fiction, it illuminates shadow organizations rumored to actually exist in our world. The three novels explore a plethora of conspiracies involving real organizations like the CIA, MI6, and the UN, and public figures such as President Obama, Queen Elizabeth II as well as the Clinton, Marcos and Bush families. The Orphan Trilogy exposes a global agenda designed to keep the power in the hands of a select few. Nine’s oppressors are a shadow government acting above and beyond the likes of the White House, the FBI, the Pentagon and the NSA. One of the Omega Agency’s black ops employs MK-Ultra mind control technology on genetically engineered agents to facilitate the agendas of those in power. When Nine successfully deprograms himself from MK-Ultra, all hell breaks loose. But to gain his freedom he must bust out of the Pedemont Orphanage and break into Omega’s other orphanages and underground medical laboratories around the world. In the process he uncovers chilling scientific experiments taking place on children. Could something like this ever take place? Or, is it already taking place somewhere in the world right now? The trilogy also has a poignant, romantic sub-plot. It contains the kind of intimate character portraits usually associated with psychological thrillers. Book/Film/TV references: The Manchurian Candidate, The Saint, The Da Vinci Code, Bond, Dark Angel, The Jackal, Mission Impossible, Salt, The Pretender, Bourne, The Island, Taken. This unique, unpredictable and epic spy thriller series covers everything from political assassinations and suppressed science to young adult romance and accelerated learning techniques. Buckle up for a nail-biter to the very end. Written by father-and-son writing team Lance & James Morcan (authors of Fiji: A Novel), The Orphan Trilogy was first published in 2013 by Sterling Gate Books. A feature film adaptation of The Ninth Orphan is currently being developed.